Sweet, sour, salty, bitter and spicy – Thai food is one of the cuisines around the world that encompasses all five different flavours. As one of the top ten most popular cuisines in the world, Thai food is actually a beautiful, harmonious union of Eastern and Western influences, characterized by dishes with strong aromatic elements and a spicy kick! In today's article, let's delve into the origins and history of Thai cuisine, which is just as colourful as its yummy dishes! Since historical times, seafood, plants and herbs have been popular ingredients in most meals. Heavy quantities of meat were usually avoided, due to the country's background in Buddhism. Thai culinary traditions have also been influenced by its neighbours throughout the centuries, and regional dishes tend to share similarities with its neighboring states. For example, Northern Thai cuisine shares dishes with Burma's Shan State, northern Laos, and China's Yunnan Province. The cuisine of northeastern Thailand is similar to that of southern Laos, Cambodia's Khmer cuisine and Vietnamese cuisine. Southern Thailand, which has many dishes with copious amounts of coconut milk and turmeric, shares that with Indian, Malaysian, and Indonesian cuisine! On top of the regional cuisines, there is also Thai royal cuisine which stems from the Ayutthaya kingdom (1351–1767 CE). Its cooking techniques and use of ingredients greatly influenced and shaped the cuisine of central Thailand, including Bangkok! Did you know? Many dishes that are popular in Thailand today, like chok (rice porridge), salapao (steamed buns) and khao kha mu (stewed pork and rice) were originally Chinese dishes! They were introduced to Thailand by the Hokkien people starting in the 15th century, and later on the Teochew people in the late 18th century. The Chinese also introduced the wok, deep-frying and stir-frying techniques, as well as bean pastes, soy sauces, and tofu to the Thais! Western influences arrived on Thailand's shores in 1511, when the first Portuguese diplomatic mission arrived in the kingdom of Ayutthaya. But the most notable Western influence has to be the chili pepper in the 16th to 17th century – it is now one of the most important ingredients in Thai cuisine! Apart from that, Portuguese and Spanish ships also brought with them new food and ingredients during the Columbian Exchange, such as tomatoes, papayas, corn, pineapples, pumpkins, cashews and peanuts! 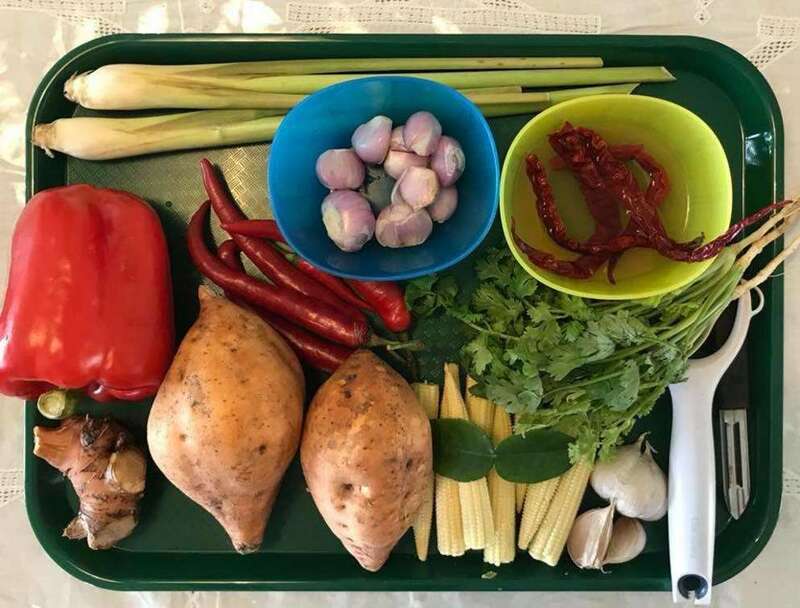 Do you want to learn more about Thai cuisine and try your hand at cooking some Thai classics like Red Curry and Mushroom Laab? Don't miss the open class that's coming up on 12 December in the vicinity of Upper East Coast Road, or contact us to organize your own private party! This workshop can be a wonderful bonding experience for your team, a hen's party or a birthday party! We look forward to having you in this Thai cooking workshop, where you will learn and experience the culinary pleasures in Thai cuisine!